This is a recipe from my mother in law. She makes it every Thanksgiving for her family, and is my husband’s favorite Thanksgiving dessert. Mix together raspberries, sugar, cornstarch, minute tapioca and water. Mix and let sit for 10 minutes. 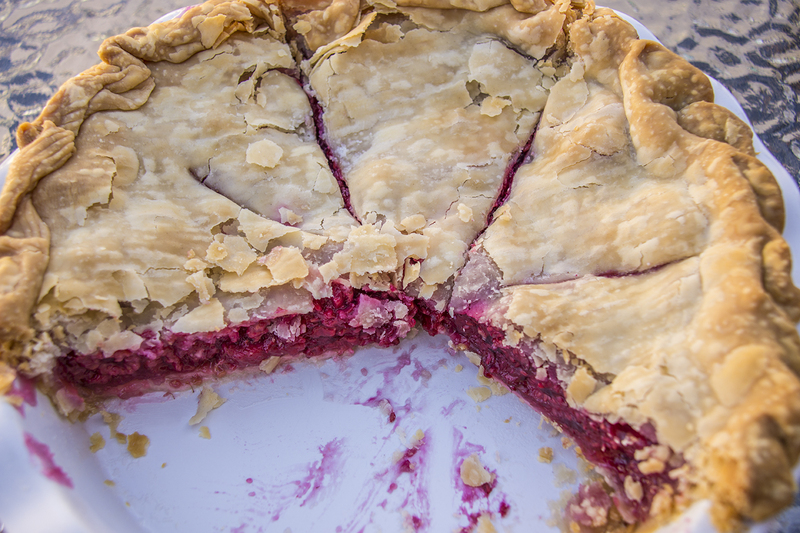 Put berries in bottom crust, and put 4 – 1 tablespoon pats of butter on top. Put on top crust and crimp edges. Make slits in the crust to allow the steam to escape. Bake at 425° for 15 minutes. Reduce heat to 350° and bake for 45 more minutes. Let the pie cool for at least 15 minutes before serving. This has a tendency to bubble over. To catch the drips, put a foil-lined baking sheet on the rack below the pie during the last 15 minutes to save yourself a lot of cleanup. The support photos below are from when I made 2 pies for Thanksgiving this year. I’m not the best baker by any stretch of the imagination, so I always buy my pie crust pre-made. I’ve found that in baking, you have to follow the instructions to the T, or things go badly. I’m pretty good at following directions the first time, but I like to play with recipes and make them my own. I buy the raspberries from Costco, when they are on sale and looking good. I freeze them in their plastic containers, and use them later on. They keep surprisingly well!